Fireworks anemone (Pachycerianthus multplicatus) and long-clawed squat lobster (Munida rugosa) is awarded Runner up in this years Advanced British prints category at the NEC Dive show. 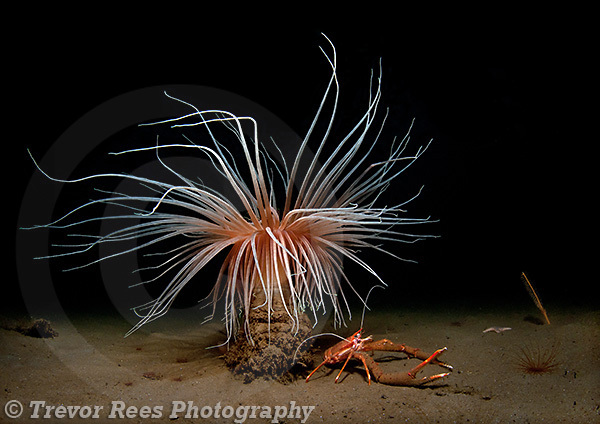 A print of a fireworks anemone (Pachycerianthus multplicatus) together with a long-clawed squat lobster (Munida rugosa) from Loch Goil in Scotland is awarded Runner Up in the Advanced British prints category at this years NEC Dive show. These large anemones are generally only found in deeper calm water on muddy bottoms with Scottish sea lochs being a good location for them. This shot was taken at around 25 mtrs depth at Loch Goil.